The daily learning of Chumash with Rashi is one of the three daily regimens which make up the learning of Chitas. A Chumash (from chomesh, “a fifth”) is the printed form of the Five Books of Moses. The Chumash is further divided into fifty-four sections, referred to individually as a parshah (portion), to be read publicly one parshah per week as part of the Shabbos service (a practice introduced by Ezra the Scribe), so that the entire Torah scroll is completed annually. 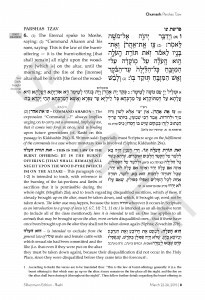 Jewish law calls for seven men to be summoned successively to the Torah reading each Shabbos, and as a result, each weekly parshah is split into seven smaller sections, referred to individually as an aliyah (summons to the Torah reading). The daily Chumash studied as part of Chitas follows precisely the weekly Torah readings. Starting from the Sunday of each week, the entire parshah that will be read publicly on the following Shabbos is studied, in the following manner: On Sunday itself, the first aliyah is studied, along with the commentary of Rashi (Rabbi Shlomo Yitzchaki, 11th century), which has long been accepted by all of Jewry as the foremost commentary on the Chumash. On Monday, the second aliyah is studied with Rashi, and so on throughout the week, until the seventh and final section of the parshah is studied on Shabbos itself. The entire cycle of public Torah readings – and consequently, the cycle of Chumash studied as part of the daily Chitas – begins anew each year on the festival of Simchas Torah (“Rejoicing over the Torah”), which is celebrated on Tishrei 22 in the Holy Land and on Tishrei 23 in the Diaspora. When the reading of a particular parshah is deferred for a week or two due to a festival coinciding with Shabbos (in which case a special reading relating to the particular festival is read instead of the weekly parshah), the daily study of Chitas corresponding to that parshah is likewise repeated for a week or two – until that particular parshah is read publicly during a Shabbos Torah reading. Chayenu includes the weekly portion of Chumash with Rashi, enabling one to complete the entire Chumash every year! This section features a most exciting, and easy to read English translation of Chumash and Rashi, alongside the (vowelled) Hebrew, including valuable, insightful footnotes for better comprehension of Rashi. Chumash and Rashi in Hebrew with vowels. A comprehensive English translation of Chumash and Rashi. Footnotes that explain some of the difficult passages in Rashi.